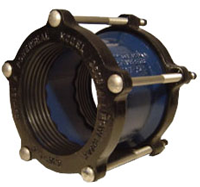 The PowerMax 3506 Standard and 3506LB Long Barrel Ductile Iron Barrel Repair Coupling are certified to NSF/ANSI 61. They are the premiere ductile iron bolted coupling which only requires one common sleeve and corresponding set of end glands for each nominal pipe size. Bolts and Nuts: Low Alloy Steel per ASTM A325. ASTM A563, and AWWA C219. Due to the weight of the 14.00" and 16.00" PowerMax Couplings, they will require LTL Freight. Please call us direct to get shipping costs for these two sizes. Note: Pipe diameters less than IPS/STEEL rated up to 50 PSI work pressure.